Southern Illinois University Edwardsville will host “We Are One … Are We?” Monday, October 3, in the Morris University Center Conference Center. The SIUE Office of Institutional Diversity and Inclusion will present the event. Faculty members Jessica Harris, PhD, and Bryan Jack, PhD, assistant and associate professors, respectively, of historical studies in SIUE’s College of Arts and Sciences (CAS), will lead the event. Both were involved in the previous SIUE Black Lives Matter conferences during the 2015-16 academic year. The film “White Like Me: Race, Racism and White Privilege in America” will be shown with analysis, and question and answer sessions. Brown will welcome attendees at 8:30 a.m., followed by remarks from SIUE Chancellor Dr. Randy Pembrook. Free registration begins at 8 a.m. with a continental breakfast included. Register at siue.edu/institutionaldiversityandinclusion. 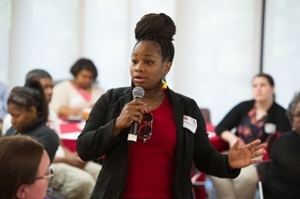 Photo: Jacenda Liwo, graduate student in the SIUE College of Arts and Sciences, speaks during the second SIUE Black Lives Matter Conference during April 2016.